Are Financials Stocks Set to Surge? 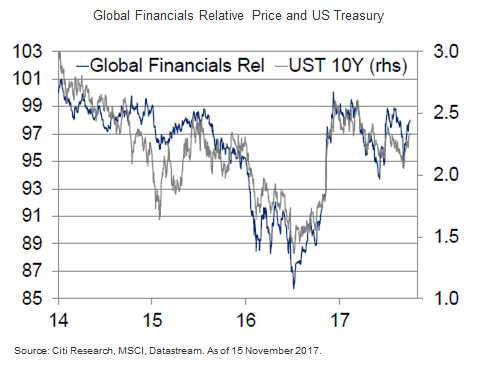 Should investors be concerned about financial company stocks given stubbornly low interest rates, flattening yield curves, political risks in Europe and lack of consensus of US tax reforms? With the Q3 2017 earnings season largely complete, European banks fared well by beating consensus by 5%. Meanwhile, US banks delivered 3.5% above consensus while US insurance and diversified financials outshone their European counterparts. European banks have fared better than expected, even after successive positive earnings revisions since mid-2016. While European banks and diversified financials are down from their Q1 2017 highs, they have avoided larger downgrades which impacted them in 2016 and before. Recent 2017 estimates reduced earnings-per-share (EPS) forecasts for the insurance sector largely due to hurricane losses. However, 2018 forecasts have been upgraded to compensate. The best-performing above consensus Euro and US sub-sectors were Euro and US insurance given lower than expected hurricane losses as well as Italian banks. Citi analysts believe that US long rates still remain the principal driver for financials sector returns. Citi forecasts 10-year US treasury yields at 2.75% by end-2018 versus 2.38% currently.